nendo has conceived a tree house ‘bird-apartment’ structure which is intended for use by one person, and / or multiple birds. developed for the momofuku ando centre – committed to promoting access to nature – in the forest of komoro city in japan’s mountainous nagano prefecture, the dwelling takes on the typical iconic house profile, divided in two. 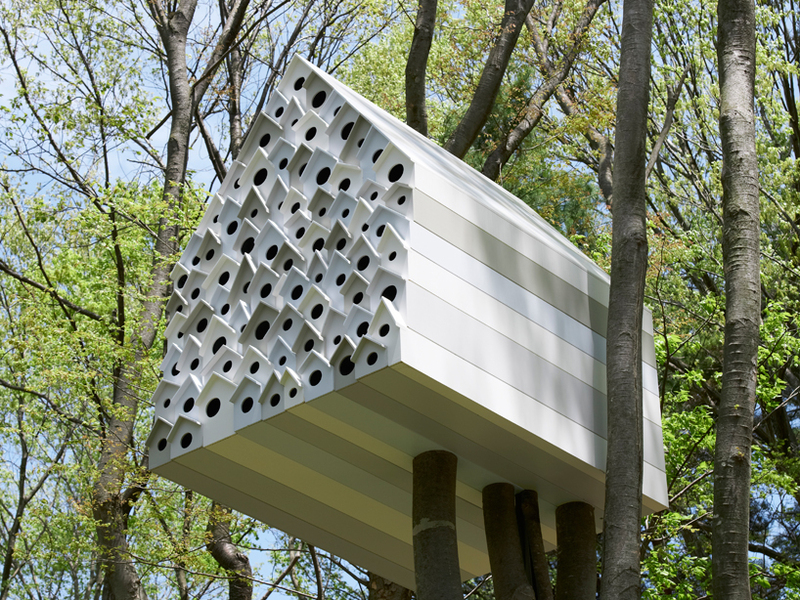 one side features 78 nest spaces for birds, while the other has an opening for one person to enter and peer into the birds’ nests from inside the tree house. how much is rent? cause im not so convinced by the voyeuristic nature of the backside. must be pretty cool as a human though. you have to face death to climb that stair!! practical? what makes you so sure the birds won\’t decide to fly in to the human section instead of the small holes on the other side? Bird houses should be cleaned after nesting.. Oversight? But.. I would LOVE to have one for Purple Martins. please could you add one more shot through the peep hole showing the birds nest…Thx. Has anyone here a construction drawing, I would like to have him. Beautiful concept, excellent execution. I guess colour should have been combination of green and wood brown combination to make it more natural. Cleaning should be consider. may be few small holes at bottom for water drain.